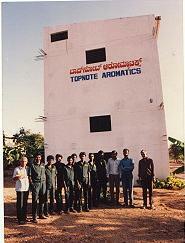 Topnote Aromatics is a chemical industry located in Mysore, India. Topnote's sales, customer support, and manufacturing teams combine to offer a full range of specialty products. We strive to offer value added services in an efficient and responsive manner, while observing strict environmental protocol. We have been manufacturing molybdenum chemicals since 1983, required for the formulation of secondary and micronutrients used by the agricultural sector. Our products are being used by the micro-nutrient manufacturers and others. We also make the above chemicals in LR and AR grades. These are being used as laboratory reagents. Some of our valued customers are M/s Glaxo India, M/s S.D.Fine Chem Ltd, M/s Rankem and M/s E.Merck India. We look forward to assisting you in achieving your production and processing goals.